Rickey Smiley may be available for your next special event! Rickey Smiley is the host of BET's highly popular nightly comedy showcase, "ComicView." The show is consistently among the network's highest rated programs, and has been a launching pad for numerous superstars of comedy, such as Cedric The Entertainer and DL Hughley. Rickey Smiley first took the stage at an amateur comedy night at The Comedy Club in his hometown of Birmingham, Alabama. From there it was on to the big leagues touring the country with such acts as George Wallace, Will Downing, Dottie Peoples and Najee. His television appearances include Showtime at The Apollo, HBO's Def Comedy Jam and Snaps, The Nashville Network, Uptown Comedy Club, Comic Escape, and of course, BET's own ComicView, where he competed in the show's notorious Grandstand. Rickey Smiley takes everyday situations and turns them into everyday humor. He does it all with the help of a few good imaginary friends of his. Such hilarious friends include 90-year-old church lady, Ms. Bernice Jenkins, along with Lil Daryl, a character that gained much notoriety on BET's "Live from L.A."
Rickey Smiley studied at Tuskegee University. He is a 1992 graduate of Alabama State University, where he earned a Bachelor's degree in English. When in his hometown of Birmingham, otherwise known as Magic City, you can catch Rickey as part of the "Home Team" Morning Show on WBHJ-95.7. "Ms. Bernice Jenkins" can also be heard with her daily church announcements on Heaven 610. Establishing himself as a clean comic, his "down home" southern humor has made him a favorite in the nations top clubs. His brand of "church humor" resonates with his audience unlike any comic before him. His demographics have a broad range from 7 to 87. Audience members at the comedy clubs always include grandparents, as they know they will not be embarrassed by Rickey's material. When attending a large venue show it is not unusual to find parents bringing their kids to watch Rickey's show. A versatile performer, Rickey's characters have become his trademark. From Bernice's church announcements to Coach McClainy's lack of motivational skills, Rickey's audience can't seem to get enough of Rickey dressed up as his characters. 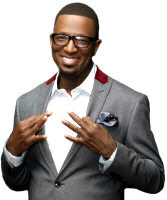 It is his genuine love of performing that has brought Rickey Smiley many honors. He was a special guest presenter on the 2001 NAACP Image Awards, broadcast on the FOX network, and was a co-host for the 2002 Stellar Gospel Music Awards Banquet. Although he is known for his "Southern" humor, Rickey Smiley has also played to sold out crowds at Madison Square Garden, The Universal Amphitheater and the Lincoln Center, just to name a few. Rickey Smiley truly has struck a chord with his core audience. His star is shining brightly, and his fans couldn't be happier for it! booking entertainment, such as major name entertainers or celebrities, booking Rickey Smiley, booking information on Rickey Smiley, or hiring Rickey Smiley for your special event, or to book or hire Rickey Smiley, or if you are seeking the Rickey Smiley booking agent for corporate entertainment or for a private party. Consider the opportunity to book Rickey Smiley or other entertainers for a wedding, birthday, anniversary, business meeting or convention. If you are not a talent buyer, we are unable to provide Rickey Smiley manager or management contact information. Consider this your official Rickey Smiley booking agency web site – The booking agent who works for you! does not claim or represent itself as the exclusive agent, representative or management of Rickey Smiley. Rickey Smiley, comedian - booking agent. This artist may be available for your next event. Book him if you can. You will have the time of your life!